Feel confident to trudge through the mud in the Georgia Boot Marshland pull-on duck boot. 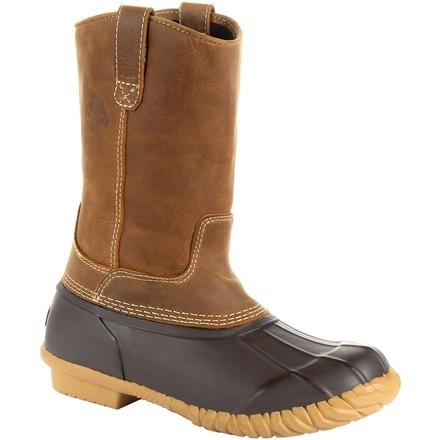 A barnyard proof SPR leather upper and waterproof rubber shell with a cooling fiber infused lining will protect your feet from mud, cow pies and any other barnyard wastes you may come across. The removable AMP LT insole has a polyurethane base with a memory foam topper, giving you an ultra-comfortable customizable fit with every wear. The oil and slip resistant rubber outsole is joined to the rubber shell through a vulcanized construction, making it incredibly durable. Georgia Boot Marshland. Premium features packed into a classic duck boot style.